An outstanding pair of soloists from the Boston Ballet – Whitney Jensen and Yury Yanowsky – joined the students of the University of North Carolina School of the Arts to present an excellent production of P. I. Tchaikovsky's Nutcracker Ballet, the first of a dozen performances to grace the stage of the Stevens Center in this 49th annual production, an all-school effort featuring the students of the Schools of Dance, Music, and Design and Production. For many years, the UNCSA Nutcracker was considered a benchmark production because of its adherence to the original choreography of Lev Ivanov and Marius Petipa. But in recent years only the Pas de deux of the second act has retained this cachet while the rest of the ballet has yielded to a modernist focus on plot and entertainment, streamlining where possible. (I noted six cuts in the first act alone.) Nonetheless, there is a great deal of excellent dancing, and the entire production excels, especially if one considers the youthfulness of the performers. Clara, the protagonist of the story, was danced with surprising technique and maturity by Sarah Yang, who maintained her poise throughout the evening. Her friend and young suitor, Sasha, was danced and mimed by Seth Acenas, with grace and gravitas. 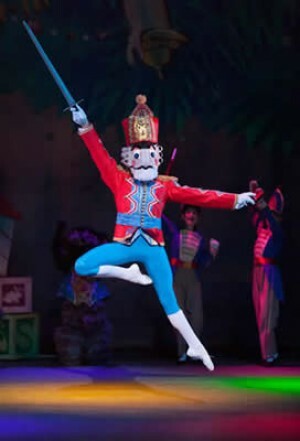 The robotic Toy Soldier, Ryan McNally, danced well but lacked the expected mechanical motions – perhaps because of the very rapid tempo and somewhat ragged syncopation of the music! Striving for humor, the directors of this Nutcracker have pushed the combat of the toy soldiers and the mice from battle to burlesque, much to the amusement and entertainment of the audience. And to add to the humor, Clara's coup de grace (throwing her shoe at the Mouse King) missed its target and sailed into the wings, much to the further amusement of the full house. Ahna Lipchik was excellent as the Snow Queen, despite the frenetic choreography of the Adagio, and exquisite in the ensuing Snow Waltz solos. Her partner, Ian Schwaner, (sporting a trendy 5-o'clock shadow) accompanied her well and put in some impressive entrechats. The second act appearance of guest ballerina Whitney Jensen as the Sugar Plum Fairy was the high point of the evening. From her first pirouette she dominated the stage: tall, elegant and perfectly balanced. Her Sugar Plum variation was gorgeous – delicate and poised; and the piqués fouettés in the ensuing Coda, breathtaking. Her partner, also from the Boston Ballet, Yuri Yanowski, is a powerful dancer and a perfect partner. In the Finale of the Sugar Plum group, his grand manège brought cheers from the audience. There was a tremendous amount of sheer raw talent on stage, at every moment. Much of this talent showed up as artistic excellence, but often enough, the self discipline disappeared once the hard part was over: lines were crooked, arm positions were akimbo, bows were sometimes haphazard, and even sloppy – perhaps a case of opening night jitters. Conducting his first Nutcracker, new faculty member Christopher Lees led his fine ensemble of student musicians in a brisk and well-played performance of Tchaikovsky's challenging score. A few more cellos would have helped the second act Adagio in the Pas de deux, but otherwise balance, tone, and intonation were all excellent. The harp cadenza before the Waltz of the Flowers, played by Kristen Bruce, was outstanding, as was the Variation of the Sugar Plum Fairy, played on the strangely un-pedaled celesta by Christopher Brown. Nutcracker is a technical challenge in the production department – hundreds of costumes, constantly changing lighting, and a magically growing Christmas tree, which this year seemed to have a will of its own. The lighting (Brad Fields) was outstanding, as were the costumes and the scenery. Over-amplification of the otherwise excellent children's chorus (Winston-Salem Youth Chorus) and outrageous reverberation reminded one of a skating rink! The same cast will be featured on Saturday night, December 13. Performances run through December 21st. See the sidebar for complete listings.